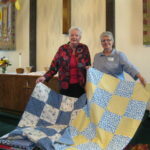 ANNUAL QUILT BLESSING FOR 2018: We give our thanks to our faithful sewers who have donated their time and talent in the creation of these beautiful lap quilts.This year 64quilts have been sewn by Cindy Smith, Pam Dressel, Janine O’Connor, Lisa Sowers, Lois Foley, Marguerite Turner, Millie Thompson and Becky Matyas. 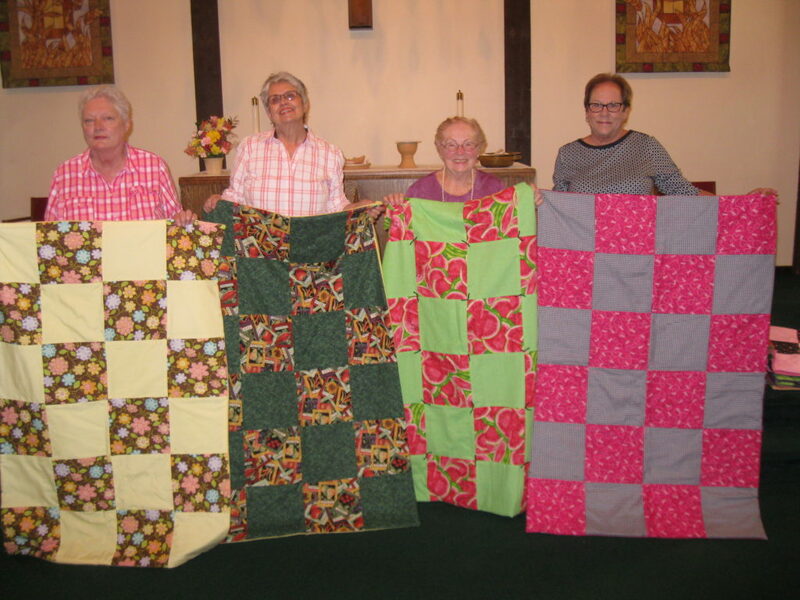 Most of the quilts will be delivered to Medina Hospice and the remainder will be given to Alzheimer patients at area nursing homes. Pictured at left: Pam Dressel, Becky Matyas, Millie Thompson and Cindy Smith, four of our faithful sewers! 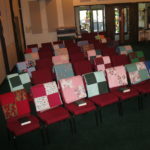 2017 ANNUAL QUILT BLESSING: Our Sanctuary chairs were covered with the beautiful colors and patterns of 120 tied lap quilts on Sunday, June 4th, . Our thanks to all our wonderful volunteer sewers: Muggs (Matyas) Turner, Cindy Smith, Pam Dressel, Janine O’Connor, Kathy Mennell, Lisa and Lois Sower, Becky Matyas, Millie Thompson and Liisa Woo. So far, 50 have been delivered to Hospice of Medina County, and 30 to Elmcroft and 25 to Brookdale South for their Alzheimer patients. 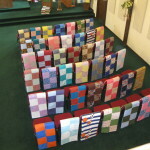 On Sunday, June 19, we will held our annual quilt blessing with one small change. Because Medina Hospital has quilts left in stock from 2015, we will be donating our quilts to Hospice this year. 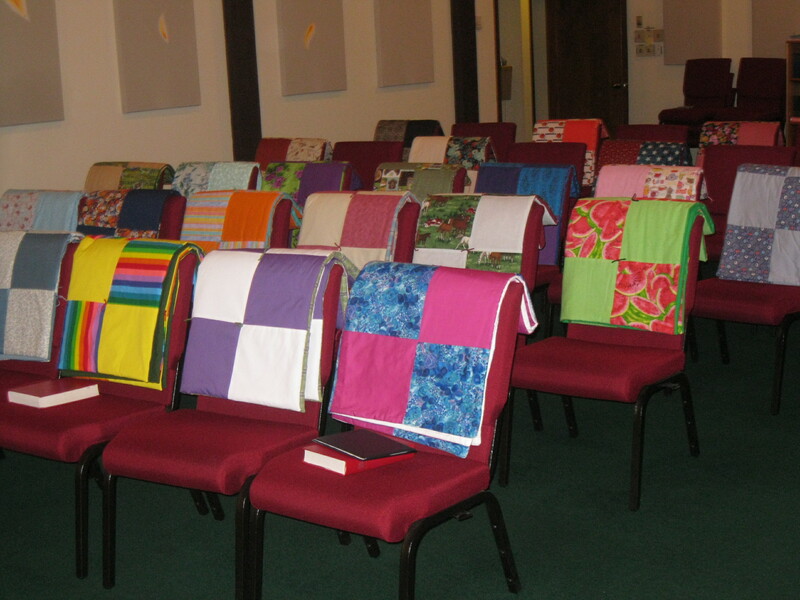 Our fifty-one quilts will be given to Hospice patients in area nursing homes and residing in the facility on Rte. 18. We would like to thank our special volunteers who sewed quilts from our kits for us this year: Pam Dressel, Cindy Smith, Janine O’Connor, Susan Patchen, Lisa Sowers and Lois Foley. Many thanks to our wonderful sewers! Our church women began this project in 2004. For the history of this project, continue reading. You will find phone numbers to use if you would like to receive one of our quilt kits to complete and instructions for making the quilts from scratch. We welcome all fabric and sewing contributions!! 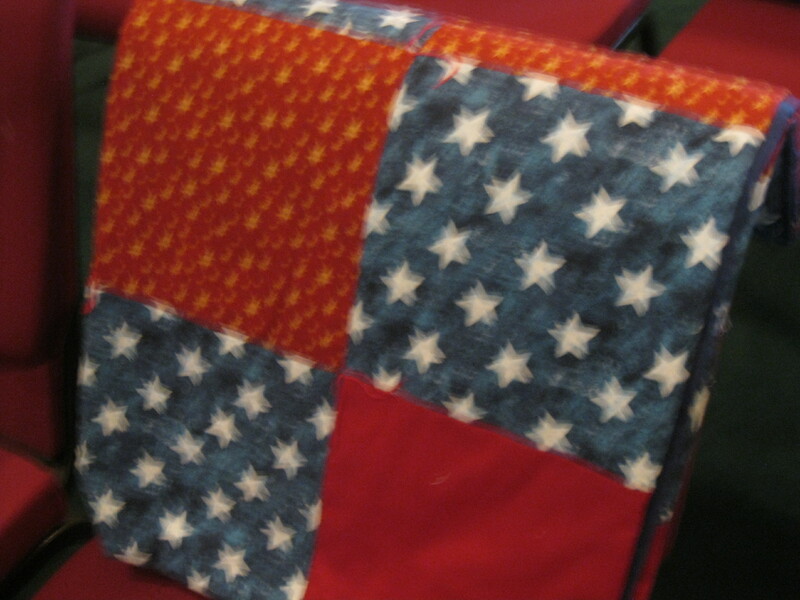 In 2004 Sherry Davis, a home economics teacher, brought a sewing project to our congregation. 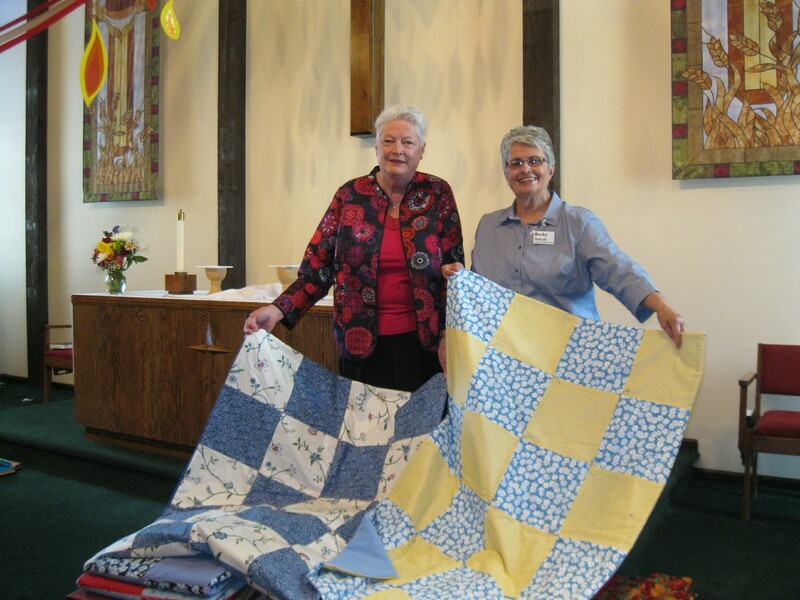 She and her students were sewing lap quilts for cancer patients at Fairview Hospital. 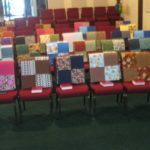 Sherry asked if Living Word would like to participate.After a few years our cancer quilts were redirected to Medina Hospital. 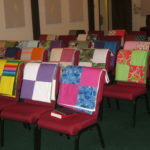 A few thousand of lap quilts have since been sewn by Living Word ladies and their friends and relatives. 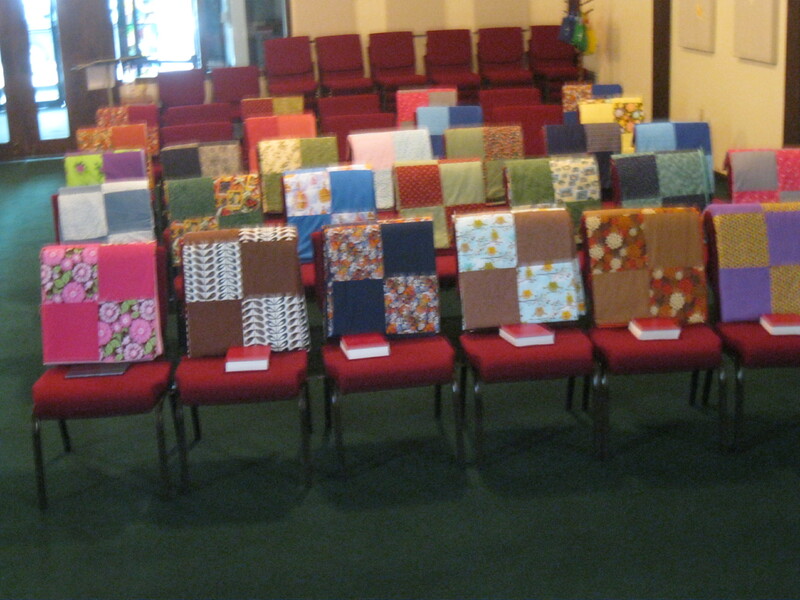 One year there were so many quilts that we were able to donate some to Hospice for their patients. When Medina Hospital opened up a new Chemotherapy Infusion Center in 2012, our quilts, unfortunately, were again in great demand. We have received many heartwarming thank you notes from appreciative recipients. If you would like to take part in this project you can help in two ways. We have kits prepared with all the supplies and directions available at the church, or you can use the instructions below to create your own quilts from scratch. If you have any questions, please contact Millie Thompson at 440-845-6495 or Becky Matyas at 330-241-5599. Your Quilt Kit should contain 12 10″ squares of matching fabric and 12 10″ squares of a coordinating fabric a 40″ x 60″ length of Polyster fiberfil for batting, a 40″ x 60″ piece of flannel for the backing, yarn or cotton thread for tying and a label with Living Word’s name. With right sides together, sew coordinating squares together with a ½” seam allowance until you have six squares in a row with alternating patterns. Repeat with remaining squares until you have four strips of six squares each. Press all seams open. Pin one six-square strip to another, alternating patterns and matching corners. Sew all four strips together and press all seams open. By pressing seams open, you will find it much easier to get the large needle with the yarn or cotton thread through the layers of quilt to tie the quilt at the end. Before stitching quilt together, sew the “Living Word” tag to one bottom corner of the flannel, high enough to not be caught in the final quilt stitching. Lay out batting on a flat surface, top with the flannel with label side up. Lay the quilt top on top with wrong side up. Flannel and quilt top should have right sides together. Pin together and trim away any large excess pieces. 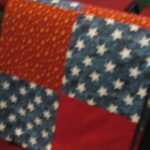 Stitch around all sides with ½” seam allowance, leaving an 8”-10” opening on one side to turn the quilt. Remove all pins. Trim batting and flannel to the edge of the quilt top. Trim diagonally across all four corners to reduce bulk. Turn quilt right-side out, poking the corners out to leave a nice sharp corner. Slipstitch the opening closed by hand. Using a large, sharp, metal needle, tie yarn or cotton thread at each intersection of four squares, going through all thicknesses. You can put scotch tape on the end of the yarn and cut it into a point to thread the needle. Cut each tie about 3”- 4” long and tie two or three times in a knot. No bows! You will be tying at a total of 15 corner intersections. Press the quilt and remove any loose threads. Please return the quilt to church in the blue bag. If you want to create quilts from scratch, you will need two 30” lengths of coordinating fabric (you might want to get 31” or 32” just in case) cut into 10” x 10” squares, for a total of 24 squares. For backing, you will need a 60” length of flannel which should be washed and hung to dry, a 60” x 40” rectangle of polyester quilt batting, 3 or 4 oz. in weight, and about 2 yards of coordinating yarn or cotton thread. Please remember, these quilts are being given to cancer patients at Medina Hospital and to those being cared for by Hospice. We want it to be perfect for them so please take the time to do a nice job!